The baby’s neurological system is primed at birth. A healthy foundation depends on a healthy nervous system after birth and a smooth transition from the womb to the outside world. Colic in newborns affect 10-40% of infants worldwide. It is a condition of prolonged and intense crying. What babies are indicating via their distress is generally unknown. 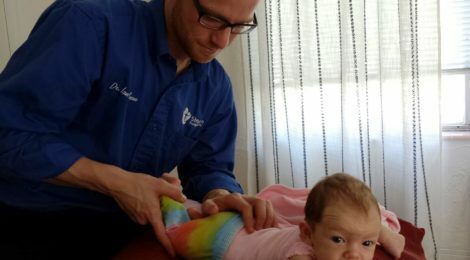 To understand colic, chiropractic offers a new insight involving the fascinating, albeit delicate, nervous system. The case has often been made that colic is an issue involving the infant’s developing digestive system. What we know now through new scientific research is that the human gut is actually a separate branch of the body’s nervous system, coordinating digestion, elimination, and the microbiome. Researchers call it the gut-brain. What’s less known about the gut-brain is how it connects to the overarching nervous system through the Vagas Nerve. Can trauma to the spine and cranium affect the nervous system in the gut? Are there ways to improve and heal the function of the nervous system? These are questions worth asking whether colic is a gut issue or involves the larger processing centers of the nervous system. The infant must adjust to her new life in the world in two primary ways. One involves learning to process sensory impressions and stimuli without getting overwhelmed. The other involves metabolizing breastmilk (or formula) in the gut and forming a healthy microbiome. These adaptations are innate to infants, but with an obstructed nervous system they can become enmeshed with symptoms of distress. Interestingly, colic often stops around 3-5 months of age—a time of great nervous system maturation. Common advice is to wait until the baby “outgrows” the issue. But this doesn’t help parents in their daily lives, and it doesn’t address the deeper problem that the baby is trying to resolve. 4. Providing support and recommendations that work to enhance function. Colic can hinder a family’s bonding, sleep, and overall well-being. And it can also hinder the child’s future development. If it “goes away on its own,” it does not mean that the old pattern of early trauma or misalignment has gone away, too. Colic can be a wake-up call for parents to find these deeper factors and address them early on. Often the root issue stems from a traumatic birth process, but there are multiple sources which can lead to nerve system distress. The chiropractic approach is not about treating any one condition and it does not rely on conditions going away on their own. Rather it aims to ensure that a healthy nervous system exists so that the life and health of each child is maximized. Chiropractic allows us to move through life without underlying hindrances so we can reach our full, potential. ← Childbirth as Traumatic as War?